Whether it is a humble cottage or a grand country estate, every house has its own special look, its own personality. Any house that you have loved living in is full of memories and deserves to be commemorated in rich and subtle colours that only pure wool yarn can provide. 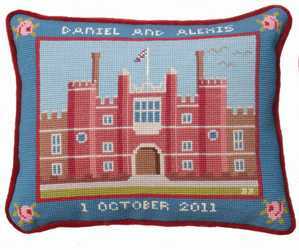 Barbara Bernard offers a needlepoint tapestry design service. Her na�ve style is inspired by North American folk art and is perfectly suited to the medium of needlework. Now you can own a unique memento of a house you are leaving, a much-loved childhood home, or simply a house you are proud of. Text such as a house name, family names, and dates can be worked into the border to personalise it even further. Barbara designs from your photographs. (For information on taking photos for a house portrait, see "Taking photos"). 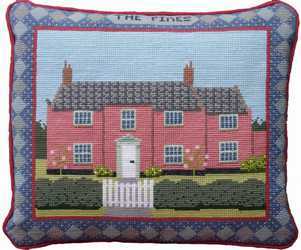 The design can be any size or shape, to suit the style of house and can be made up into a cushion for your sofa or framed to hang on the wall. 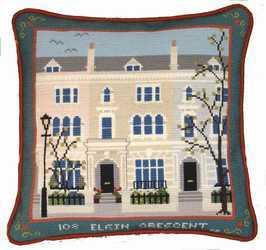 Prices start at �300 for a finished custom-designed cushion measuring approximately 30cm (12�) square. To discuss a commission, please contact us. See more examples of custom-designed needlepoint in the gallery.